Adjustable Tripod Stands are used with gravity skatewheel and 1-3/8" roller conveyor. Height is adjustable through a locking screw that puts tension against the inside support rod. Portable castered support allows straight sections of gravity skatewheel or 1-3/8 in dia. 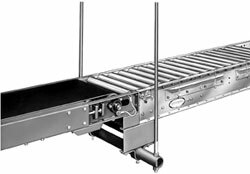 roller conveyor to be easily moved. Portable castered curve support allows curved sections of gravity skatewheel sections or 1-3/8 in dia. roller curves to be easily moved. Floor locks can be supplied-optional. Poly-tier supports provide sturdy support for multi-level conveyor lines. Ceiling hangers provide safe and sturdy means of gaining high conveyor elevations.